The Energy Communities Alliance (ECA) and the Environmental Council of the States (ECOS) are hosting a joint meeting to facilitate discussion of DOE’s proposed interpretation of the statutory definition for high-level radioactive waste (HLW). Local, state, and tribal government officials, the Department of Energy (DOE), and others are invited to share and discuss perspectives on DOE’s interpretation, potential challenges, and opportunities for coordination in regards to the examination of defense HLW disposal alternatives. This event is by invitation only. Registration information and a preliminary agenda will be shared with ECA members and other invited guests in advance. Members of the ECA Board of Directors are invited to participate in a roundtable discussion to meet with officials from the DOE Offices of Environmental Management, Nuclear Energy, and the National Nuclear Security Administration, as well as discuss local government/member priorities and site-specific concerns. In conjunction with the 2019 National Cleanup Workshop, Members of the ECA Board of Directors are invited to participate in a Board Meeting in order to review ECA activities and operations, and discuss local government/member priorities and site-specific concerns. Members may expect to hear from the Department of Energy’s (DOE) Office of Environmental Management, as well as other DOE program offices. 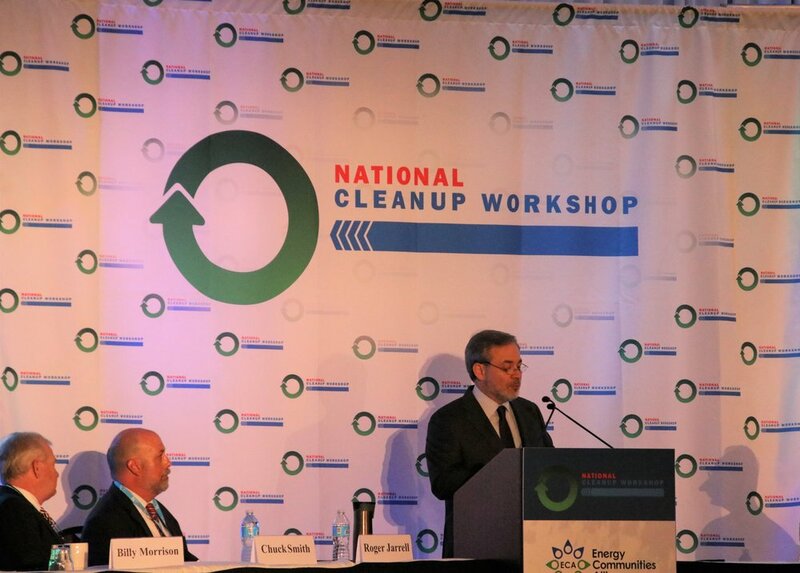 The Energy Communities Alliance (ECA), in cooperation with the U.S. Department of Energy (DOE) Office of Environmental Management (EM) and the Energy Facility Contractors Group, is pleased to announce the fifth-annual National Cleanup Workshop, to be held September 10-12, 2019 at the Hilton Alexandria Mark Center Hotel in Alexandria, VA. The Workshop will bring together senior DOE executives and site officials, industry executives, and other stakeholders to discuss EM's progress on the cleanup of the environmental legacy of the nation's Manhattan Project and Cold War nuclear weapons program. In conjunction with the 2019 Intergovernmental Meeting with the Department of Energy (DOE), Members of the ECA Board of Directors are invited to participate in a Board Meeting in order to review ECA activities and operations, and discuss local government/member priorities and site-specific concerns. Members may expect to hear from DOE’s Office of Environmental Management. The Energy Communities Alliance (ECA), the Environmental Council of the States (ECOS), the National Association of Attorneys General (NAAG), the National Governors Association's Federal Facilities Task Force (NGA FFTF), the National Conference of State Legislatures (NCSL), and the State and Tribal Government Working Group (STGWG), will come together for the 2019 Intergovernmental Meeting with the U.S. Department of Energy (DOE) in Nashville, TN from November 19-21, 2019. This meeting provides opportunities for increased communication and coordination with DOE and among states, Tribes, and local communities affected by the ongoing cleanup of the nation's nuclear weapons complex. The Energy Communities Alliance (ECA), in cooperation with the U.S. Department of Energy Office of Environmental Management (EM) and the Energy Facility Contractors Group, is pleased to announce the fourth-annual National Cleanup Workshop, to be held September 11-13, 2018 at the Hilton Alexandria Mark Center Hotel in Alexandria, VA. The Energy Communities Alliance (ECA), the Environmental Council of the States (ECOS), the National Association of Attorneys General (NAAG), the National Governors Association's Federal Facilities Task Force (NGA FFTF), the National Conference of State Legislatures (NCSL), and the State and Tribal Government Working Group (STGWG), have come together for the 2017 Intergovernmental Meeting with the U.S. Department of Energy (DOE) in San Antonio, TX from November 15-17, 2017. This meeting provides opportunities for increased communication and coordination with DOE and among states, trives, and local communities affected bt the ongoing cleanup of the nation's nucelar weapons complex. The Energy Communities Alliance (ECA), in cooperation with the U.S. Department of Energy Office of Environmental Management (EM) and the Energy Facility Contractors Group (EFCOG), is pleased to announce the third-annual National Cleanup Workshop on September 12-14, 2017 at the Hilton Alexandria Mark Center Hotel in Alexandria, VA. This invitation only Peer Exchange is to discuss the continued implementation of the Manhattan Project National Historical Park. Speakers will include Department of Energy (DOE) and National Park Service (NPS) officials at the national and local levels, local-elected officials and representatives from the tourism bureaus from each of the three Park sites, and more. This meeting is the first national meeting in the new Administration focusing on the DOE Offices of Environmental Management, Nuclear Energy, and National Nuclear Security Administration. Meeting attendees will have the unique opportunity to hear from DOE officials, key Congressional staff, and other DC insiders.